The easiest way to clean insect breeding grounds in restaurants, kitchens, residential and commercial areas! It is an organic product with live microbes that consume the organic build up in drain pipes and other hard to reach areas. Preventing organic buildup reduces fruit fly breeding grounds and reduces drain clogs and plumbing emergencies. Foam product that expands into cracks and crevices. 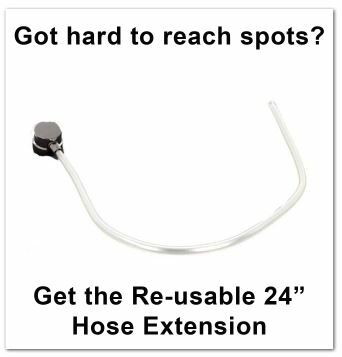 Hose extender available for getting deep into drains and hard to reach areas. InVade Hot Spot is a probiotic foaming cleanser containing premium microbes that are natural, eat scum, and eliminate odors. InVade Hot Spot forms a thick foam that stays on surfaces and slowly dissolves allowing the microbes prolonged contact with scum and odor sources. InVade Hot Spot does all of this without harsh odors or chemicals. The can of InVade Hot Spot uses a 360 degree valve and fan spray actuator to make it simple for you to coat the surfaces you need to clean. Remember that organic build-up does not just occur in drains, but can happen in any area where food, moisture or other organic matter is present. Prime areas include peeling away baseboards, machinery cracks, beverage line bundles, beverage fountain drip trays, under ice machines and voids around dishwashers, walk-in coolers and tray conveyors. We suggest applying this product at the end of the day. The foam will take a few hours to dissipate and should be left and not washed up. The foam will need to be in contact with the scum for a period of time (at least 2 hours is idea) to be most effective. Apply InVade Bio Drain in any crack, crevice, drain and any other scummy area where organic build-up has occurred. Do not apply directly to food contact surfaces unless the surface is treated with a quaternary ammonia type disinfectant, or steam-disinfected, after treatment. Storage: Store out of reach of children, between 35 and 95 degree F. This is a pressurized aerosol can - store away from ignition sources. Non Flammable.